The Internet of Things (IoT) promises a massive increase in interconnectivity between objects and spaces requiring some sense of cooperation and interaction between them. 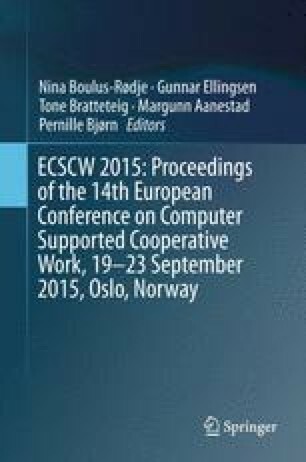 We suggest the explicit conceptualization of the cooperation between objects and spaces as cooperative work and explore some of the visions, analogies and exemplary illustrations of the IoT using key CSCW concepts: coordination mechanisms, differences across contexts, common information spaces, and awareness. The paper begins a reflection on how CSCW concepts and approaches can inform an understanding of the IoT from a social and practice perspective raising crucial questions for the design of these technologies in the future. An issue of paramount importance will be negotiating the boundaries between (networks of) objects and people, making them transparent, understandable and adaptable. IoT-A (2010) Internet of things—Architecture project (IOT-A). http://www.iot-a.eu/public.